For the last few months artist Martin Heron has been working in Swallownest, commissioned to establish a piece of public artwork in the village (you can read my first blog to learn more about it). After conducting initial research, holding consultations and workshops within the local community, the artwork is now ready to be unveiled. 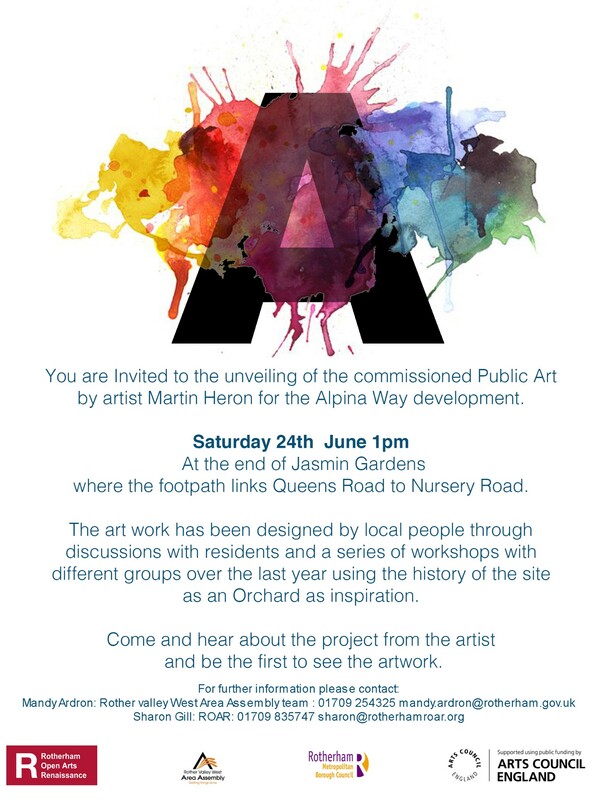 The big opening will take place on Saturday 24th of June at 1pm at the end of Jasmin Gardens, at the footpath linking Queens Road to Nursery Road. The ceremony will start with a short presentation given by Martin Heron discussing the ideas around the project and local community input. Martin, as discussed in the previous blogpost, is known locally for his piece The Corn Law Rhymer Roundabout on Wortley Road in Rotherham, which was named Roundabout of the Year in by the UK Roundabout Appreciation Society. All are welcome to come and be the first to view the artwork!